bills are the biggest culprit in lowering your credit score. credit card bills that do the most harm when it comes to lowering credit scores. Pay off any outstanding debt and reduce loan balances as much as possible. Make payments on time. Lenders always look favorably on people who show discipline in this area. Most businesses report to credit bureaus. A simple phone call can confirm who does and who doesn’t. Credit bureaus will look at non-reporting vendors, like phone companies, if you are habitually late in making payments. Since bills are usually paid monthly, paying them on time could translate into a significant improvement in your credit score in just a few months. Having your name associated with a family member or close friend’s account, who pays his bills promptly, can also have a positive impact on your credit score. Every time they make a payment on time it reflects positively on you. Revolving credit, or credit card debt, makes up the bulk of your credit score. Installment loans don’t carry as much weight. For this reason, you should concentrate most of your efforts on paying down your credit card debt. Ideally, you’ll want to pay those credit card balances down to around 30%. However, if your debt burden is heavier 40-50% is a better idea. This by itself won’t be enough to raise your credit score to 700, but every little bit helps. A better avenue would be to make sure you pay your credit card bills on time. 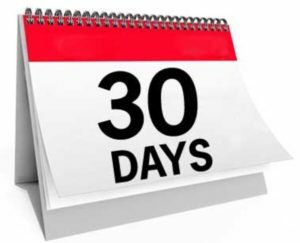 A single late payment can reduce your credit score from 50 to 60 points, should it exceed 30 days. One way is to contact the bank, or credit card company, and sign up for auto-pay. By doing so you might be able to convince them to remove the late payment from your record. Should that fail, you can also request a hearing to contest the late payment for possible inaccuracies. If the account is in collection, it can severely reduce your credit score. You may be tempted to pay it off quickly. Unfortunately, it won’t be reported to the credit bureaus automatically. It’s sometimes better to negotiate a “pay-for-delete” agreement with the collection agency. This will guarantee that the collection is completely removed from your credit score. However, you should always get an agreement like this in writing. Think of your credit score like a diet. You’re not going to lose 50 pounds overnight. Well, you not going to raise your credit score 200 points overnight either. Both involve careful planning and smart choices. And, just as you check periodically to see how many pounds you’ve shed, you’ll need to make regular checkups on your credit score. You’ll want to know where you stand before moving forward. The bulk of your credit score is comprised of outstanding loans and credit card debt, and whether you are adhering to the terms of the agreements—are you making your payments on time. If you’ve been having trouble making payments on time, try sending reminders to yourself, either through your laptop calendar, or through the phone. Remember, you can always setup autopay for all your accounts. The more outstanding debt you have, the lower your credit score will be. Again, the biggest culprit is credit cards. If you have an affinity for credit cards, and they’re causing you problems, you might want to consider secured credit cards. Secured credit cards allow you to load funds onto the card and use only the funds you’ve deposited. If you have credit cards you no longer use, you may be tempted to close them thinking that will help your credit score. On the contrary, keeping them open will be more beneficial. Those inactive cards contain a history of all your transactions. A long stable relationship with the card issuer will be viewed favorably by the credit bureaus. Better would be to charge a small amount to your inactive cards and pay them off each month. This will create a series of new on-time payment history which will be viewed favorably by the credit bureau. Just as credit cards can ruin your credit health, they can also be an asset when used wisely. Maintaining a low credit card balance and making your monthly payments promptly goes a long way in demonstrating that you are fiscally responsible. Simply put, “good credit” is a record of how disciplined you are in making your payments on time. One of the best indicators of this is your credit card record. If you don’t have a credit card, then you probably don’t have good credit. When you apply for a credit card for the first time, check your credit score first, then apply for a card that that is tailored for people in your credit score category. Also, look for cards that reward first-timers with things like cash-back and other perks. When you make timely payments, or pay off your balances, the card issuer reports it to the credit bureaus. Also, making timely, monthly payments saves you money on interest. However, using credit cards can still reflect badly on your credit health if you carry large balances, even if you make timely payments. The credit bureaus will view these large balances as undisciplined spending habits. To counter that, try limiting yourself to about 30% of your allotted credit. Should you exceed that limit, try making two payments per month so that the credit bureaus only see that you’re using more than half your credit, and not those huge balances. Again, even if you’re not using a card, keep the account open. The credit bureaus also consider the average age of your card accounts. Closing old accounts and opening new ones will only reduce that average. Banks look at your credit history. In fact, your FICO score accounts for 15% of your credit score. Again, apply only for those cards that are conducive to helping you achieve your targeted credit score. These cards are easier to obtain, and you won’t be subjected to regular credit checks like people with higher credit scores. 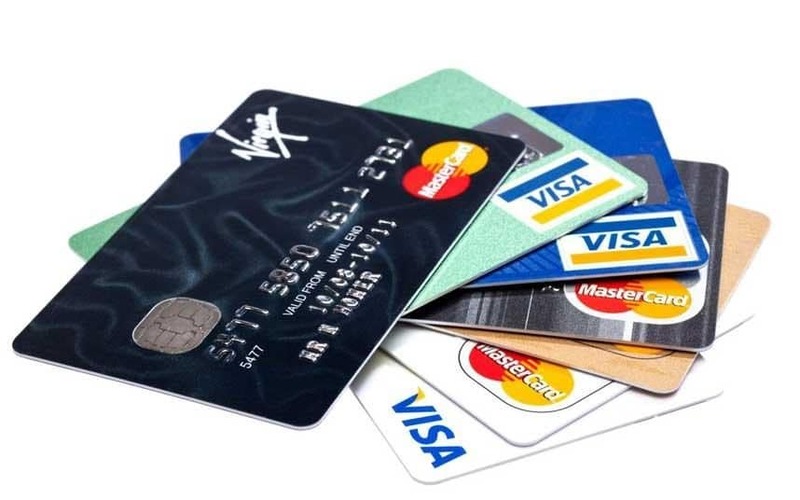 Credit cards are an easy way to increase your credit score. They are easy to get and easy to use. With the addition of phone apps, making payments is even easier: just swipe and tap. A good way to look at a credit card is not as if its fictional money, but just spend money that you already have in your checking account, but on the credit card (instead of cash or debit card). Then just transfer that money from your checking to the credit account, as if you were only using your checking to begin with, but you’re building your credit and maintaining a healthy balance on the credit card as you pay it back for each purchase. This way you don’t over spend on credit and can’t pay back what you don’t have. But, not everybody can use a credit card to raise their credit score. They may not be able to obtain the type of card that positively or significantly affects their credit score. People who fit this category will have to resort to other means. As stated earlier you can have your name associated with a family member’s account by becoming an authorized user. Their credit history will show up on your credit report. Taking out small loans (also known as credit-building loans) and paying them off on time is another way to establish a good-credit record. If you are a member, your credit union is a good place to start. Be aware that some credit unions have certain requirements for members, like working for a certain business. If you can’t join, try negotiating a secured loan. That will establish a record with the agency. A secured credit card is a great way to start a credit line or breathe life into a damaged credit line. By putting the money down on the credit card up front you are effectively spending your own money but using the credit line to establish a good credit history with the lender. Most banks offer secured credit cards and many online institutions do as well. If you have student loans, make sure they are paid up. Student loan payments are reported to the credit bureaus as healthy credit. Paying student loans on time can raise your credit score significantly. Credit card balances are known as “credit utilizations” and account for 30% of your FICO score. The key to raising your credit score is to reduce your debt. Even if you’ve shown discipline in making your payments on-time, a large residual-debt can reduce your credit score. So, if you’re planning on buying a house, you’ll need to reduce that debt first. Preferably, your credit utilization should account for no more than 10% of your total line of credit. 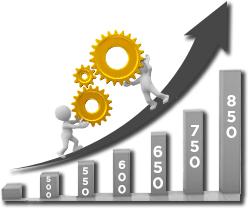 Credit utilization is measured by how much credit you have versus how much balance you have on that credit. A large debt-to-credit ratio will prevent you from getting more credit. One way to pay down these debts is the avalanche method. Gather all your debts together, along with the interest rates and concentrate most of your resources to paying off the larger debts, while making minimum payments on the smaller ones. Or, you could employ the snowball effect: pay off the smallest debts first, then apply the funds you were using for that debt to the next largest debt. Or, lastly, there’s the snowflake effect. Here you apply every available cent to reducing your debt, no matter how paltry it may seem. These so-called paltry amounts will accumulate over time and before you know it, your debt will be reduced considerably. If you had joint accounts, you might be surprised when you attempt to open a line of credit on your own. 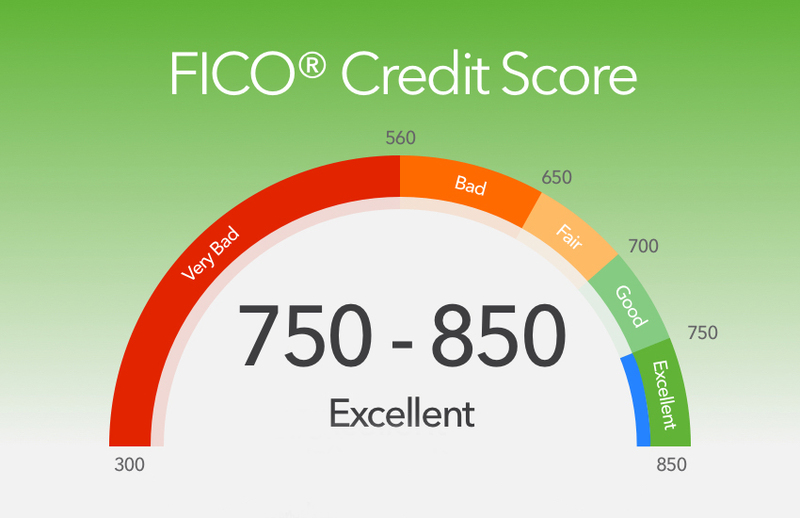 First, pull up your own credit score to see where you stand. From there you can begin taking steps to raise your own credit score. If your name is still on the joint accounts, have it removed immediately. Their credit history will continue to be reflected on your credit history, if it’s associated with your spouse’s account. You might even want to consider changing your name so that your name won’t be automatically associated with those old accounts. In the end, you may have to start rebuilding your credit all over again. You can do so by adopting some of the strategies mentioned above for people with poor credit. At any rate, the process will take time and require a lot of discipline and patience. But, in time, you, too, will be able to buy that dream home you always wanted. Frankly speaking, a foreclosure can wreak havoc on your ability to lower your score enough to buy a house. However, it is not an obstacle that is impossible to overcome. Again, you will have to show discipline in your spending habits. This includes keeping old credit cards open and charging only small amounts on them. This helps keep your debt-to-credit low and establish a record of fiscal responsibility. Focus on paying off old credit card debts before accumulating new ones. This should give your credit time to regain its health. Instead, wait until your credit has risen to an acceptable level before applying for new credit cards. Repairing the harm done by a foreclosure will take time and patience.